Yellowtail Purple Tang should not be confused with other tang species like powder blue, in which both look closely similar with one another. The fish is also not exactly purple as what the name implies because overall a quick glance would actually come up with a conclusion that it looks more like blue in color. 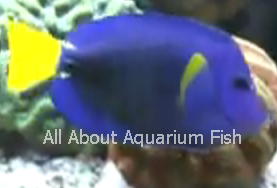 Compared with its other tang cousin in the surgeonfish family, there is not much difference in terms of dietary requirement of a yellowtail purple tang, in which the fish is entirely herbivorous and also other aspects such as compatibility with other saltwater species including tank space requirement. Generally the larger your aquarium, the better it is for your precious pet. Mixing your purple tang with other surgeonfish species can often becomes tricky because not every fish will go along well with the other. So far, adding a yellowtail to a community aquarium which has presence of blue hippo numbering 2 to 3 in a group should be fine as long as the purple tail is added later part. Under no circumstances should you try to force and mix them with sailfin, achilles or yellow tang because they will end up fighting and the injury resulted from this can be fatal to the fish. Under different conditions, whereby tank space availability becomes a restriction, the fish can often become hostile and that is when you need to take action to separate the fish to prevent further injury. In terms of difficulty level, caring for your yellowtail purple tang can be labeled as moderately challenging and to sums it all, it’s not the type of pet suitable for novice saltwater aquarium fishkeepers. What I find is that even those hobbyists with several years of experience will struggle to cope up with the fish high demands in terms of perfect water quality and foods. To me, as long as marine algae are abundance, there won’t be problems around since most of the difficult parts have already been taken care of. Needless to say that having a reliable aquarium lighting system is a must to ensure that algae can thrive in your reef tank, enough to feed your fish. Purple Tang just like all the other tang species is a very active fish and they are very sensitive towards changes in water condition. Because of their active nature, they will require saltwater with high percentage of dissolved oxygen content and this can actually be achieved by using a power filter to create enough surface agitation and mixing to encourage oxygen from normal air to dissolve in the water. Some hobbyist even move a step further by making sure that their saltwater tank system is equipped with pure oxygen supply which can be used during emergency (especially when the fish is sick) or when the temperature of the water rises too high causing dissolved oxygen content to drop.